WASHINGTON, DC, September 21, 2006 (ENS) - Conservationists, scientists and zoo and aquarium professionals have renewed efforts to stop Japan's annual dolphin hunt, which began this month and is expected to kill more than 20,000 dolphins and porpoises. The Japanese government says the "drive hunts" are necessary because the animals compete with local fishermen for limited supplies of fish, but critics argue the practice is unnecessary and inhumane. "The Japanese dolphin drive hunts are an abominable violation of any standard of animal welfare, and these hunts inflict measurable pain and suffering on animals that are intelligent, sentient, and socially complex," said Dr. Diana Reiss, senior research scientist and director of the New York Aquarium's Marine Mammal Research Program. Members of the New York Aquarium, Emory University and the World Association of Zoos and Aquariums, announced a new campaign Wednesday - "Act for Dolphins" - Thursday to end the drive hunts and has appealed the Japanese government to immediately block the practice. And more than 60 conservation groups in 32 countries, including the Humane Society International, the Whale and Dolphin Conservation Society and the Animal Welfare Institute, staged demonstrations Wednesday at Japanese embassies and consulates in dozens of cities around the world. But similar protests in recent years have fallen on deaf ears, despite growing criticism from numerous conservation groups and the International Whaling Commission. The dolphin drive hunts take place from late September to April off the shore of remote Japanese port villages, primarily Taiji and Futo. The hunts are a 400-year old tradition and are regulated by the Japanese government, who argues the cull is "pest control." 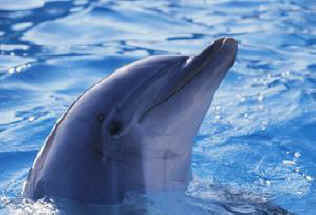 "Obtaining dolphins in this manner for our entertainment and pleasure is not only a crime against nature, but a betrayal of the public sentiment that seeks the protection and welfare of these intelligent and special animals," said Courtney Vail, U.S. campaigns officer for the Whale and Dolphin Conservation Society. "Zoos and aquariums that source animals from these brutal hunts are complicit in providing a financial incentive for their unfortunate continuation, and are in direct violation of their own codes of ethics." "The drive hunts are without doubt the most brutal way to hunt or capture dolphins anywhere in the world," said Naomi Rose, a marine mammal scientist for the Humane Society International. "These are sentient, sensitive, social creatures - the terror and trauma of the round-up and slaughter causes enormous suffering. It is bad enough the Japanese use outdated or no science to determine their kill quotas, but the suffering they cause the dolphins before death is unconscionable." "The scientific evidence is abundantly clear - the Japanese dolphin hunts are an assault on intelligent, sentient, and emotional beings with brains that should make us all stop and think," Marino said. 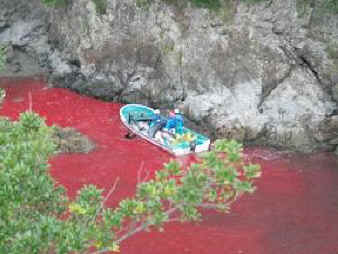 The hunts also indiscriminately target all species of cetacean. Bottlenose dolphins make up the bulk of the annual take, but the hunts also kill striped dolphins, spotted dolphins, Risso's dolphins, false killer whales, and short-finned pilot whales. Several of these species are considered threatened by the IUCN-World Conservation Union.